2P START! Live! 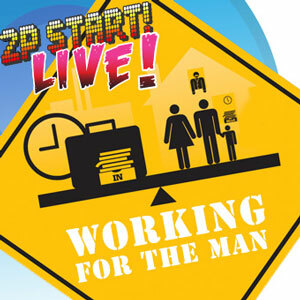 : Working For The Man Edition | 2P START! In this episode, we discuss how 2P START! manages to run even with Ray going full-time at work. Plus plenty of Comic Talk and Ray introduces a new (never-to-return) segment on a whim…just because he can! It’s always weird seeing kids on those caution signs…they just look like odd midgets who like to hold hands with others. Anyways though, as always thanks T&R for giving me some entertainment whilst I make some grub! I’m 100% Pro new segments ! Somehow you guys never fail to make me laugh with the podcasts. Chainsaw guy was AWESOME!!!! The first time I saw my friend got killed by the Chainsaw Guy I bursted into laughter! I found it so enjoyable seeing my friend get mad at the instant kill. And the new chainsaw guy reminds me of the chainsaw/lancer melee in Gears of War(from the description at least). Actually, a naked avatar would probably cost you knowing Microsoft. And I think they should give you Avatar stuff based on how many gamerscore you get in a game. Like if you get 1000 achievements in Halo 3, you would get a Chief helmet. And if you got like 100 you would get a Halo shirt, etc etc. So that your avatar could reflect your favorite games. I think that’d be cool. *sigh* I wish I could listen to this from my Wii, but it doesn’t support either format. Oh well. I’ll listen to it later today. Microsoft = Vanilla Ice when interviewed about whether he sampled Queen and Bowie’s “Under Pressure”. Also, I hear if you don’t buy the add on clothes for your avatar, then you get to wear the stylish and patented Barrel & Suspenders combo. Good Podcast as always! I haven’t noticed a drop in quality since Ray started working full time. Hopefully you can catch the chickens next time Tim!! I don’t really have much to say about this. I’m not very opinionated on any of the topics, but you know I get touchy when the topic of Nintendo’s press conference arises. It was a good podcast though. But I’m kinda glad you didn’t include Cammie, I think she’s been made fun of enough. Plus, I believe her lines were scripted so you can’t blame her for the stupid dog and wrist lines. No, no she hasn’t. Look, she’s public relations. She places herself in a public block for people to either enjoy or mock her grinning skull visage. And when she looked so very uncomfortable in the position in which she’d been thrust, it shows. Watch out for those gamers, chicka, they smell fear. When that scent hits the old factory, it usually tells us to press the assault forward and relish in the kill. That’s what gamers did. She struck me as uncomfortable in front of a crowd and awkwardly trying to attach to the wrong audience. Awkward times from PR deserves mocking. Will Kaz Hirai EVER live down RIIIIIIIIDDDDDDGGGGGEEEEE RAAAAACCCCEEEEEEERRRRR? Will Jeff Bell ever live down trolling the Gaf? Or Dennis Dyack for that matter? Will David Jaffe be able to say anything without people instantly discrediting his often correct point just because he dropped a few cuss words? Nope. So expect Cammy jokes to continue for a looooong time. I can already picture the comic about Reggie and his family. “Children and wife, unroll your napkins. Because this isn’t your grandfather’s casserole. It quite literally is a full course meal.” Actually, I really like Reggie. I’m not even sure why. It’s probably because of how he talks. I just always look forward to seeing him talk at the press conferences. Having to pay for Avatars is just about the dumbest thing I’ve heard all week. I hate that we have to pay for all the crap that Microsoft makes. In Nintendo’s eyes, Reggie’s doing his job; everyone gets to make jokes about his obvious emphasis issues, but it’s also, inadvertently, making us talk about Nintendo product. Awesome podcast guys! 31 minutes is the exact time it takes me to walk to Uni on a Tuesday morning in Melbourne, Australia, so I’m totally happy for you to keep aiming at around length. Ray, make that comic now. And on the Avatars thing, I’ve always hated Microtransactions. No one does it correctly. The correct way is to expand the game, not sell crap that used to be free or sell us stuff they cut from the game. That’s it! That’s why I like him so much! I just realized it now. Reggie can do two things: make a big announcement epic, or make a more boring announcement funny. You know, The Official Chicken Grab is still marked “never to return.” FAIL.